Following a long season from early May to mid September triathletes from the region have competed not only for individual prizes at races but have also swum, biked and run to pick up points for the regional Grand Prix with the five best race finishes in the season counting towards the Grand Prix prizes. Placings in the Regional Grand Prix are tough to get as athletes have to be good throughout the whole season and participate in the regional races on top of any national or international races they have qualified to compete in. Triathlon is a hard sport which can take a lot to recover from, which is why it is almost impossible to maintain good, consistent performances throughout the whole season. With excellent results at Darlington Tri and Alnwick in May, Northumberland Triathlon in June, QE2 Triathlon in July and Newbiggin Triathlon in September, never being off the podium in the Vet (40-49) category and always within the top seven females overall, Tracey Sample was assured of being well placed in the regional Grand Prix. On Saturday 8 November, these prizes were awarded at the Triathlon England North East Region Awards Night in Washington with Tracey Sample picking up 2nd place in the Female Vet category and 3rd place overall of every female in the region. This topped off a fabulous year where she represented Great Britain in the 40-45 Age Group Category at the European Sprint Distance Triathlon Championship in Austria in June 2014, coming 16th in Age Group. 2014 has also been a good year for Tracey which has seen her start her own business, the 24:7 triathlete, where she coaches athletes to swim, bike, run and also coaches injury rehabilitation. She also helps out at Breeze2Fitness in Amble taking spin classes for people of all abilities as the spin classes are a great way to train on the bike over the winter months. “I’ve been doing triathlon since 2004, having previously done no sport for 20 years.” Tracey told The Ambler. 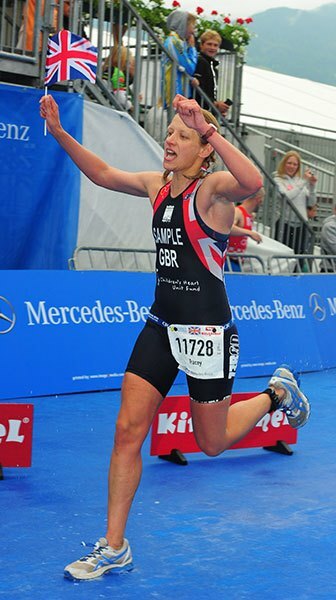 “I got into triathlon through my husband, and I entered my first Alnwick triathlon in Sept 2004. I didn’t even own a bike, couldn’t run a mile and my swimming wasn’t very good. I was really bad in my first race and I spent 18 months being last or almost last but I was hooked on the sport. “I’ve gradually improved but not many people these days believe that I was ever last. I was at my best in 2010 when I was ranked 8th in the world for my age but then had to take two years out of the sport due to a hip problem that required surgery. I was told at the point I had surgery that I’d probably never compete again, that I’d only be able to cycle socially, so I’m really proud of the fact that I’ve worked hard at my rehab and slowly built up through 2011 – 2013.